He said the bead is Guatemalan Jade, but I always thought jade was only green. 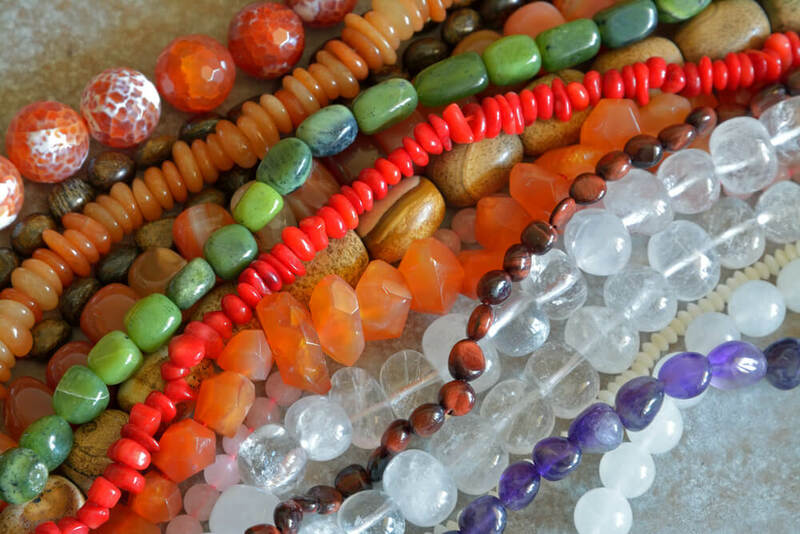 He started ordering small stones ready to be made into jewelry. Some beads, but mostly pendants, lacking a hole for a clasp and chain. He bought the equipment to drill the hole but didn’t have time to get them all done, as he prepared for his first trip home after more than twenty years. Row after row of rectangular, black-velvet lined trays filled the floor of the basement, making it look like a jewelry store. He would arrange them by color and shape and come to me and show me. He told me about the jewelry business he wants to start. He ordered a lot of stones, from Indonesia and other places, too. Jasper and moss agate and jade. Ovals, circles, squares. A few heart-shaped ones. Several small bundles arrived at once in the mailbox, little yellow envelopes strewn across the steps. Inside, tissue-wrapped treasures, which he unwrapped when the kids were asleep. He showed me the natural patterns on the Jasper and let the images reveal themselves to me. Tiny naturescapes, some so realistic, you would think they were paintings in miniature. Bare trees reaching over a lake, outlines of swans and wolves, snow-capped mountains on a horizon, filmy water plants. I was honest about which ones I liked. The milky white ones with black lines were beautiful like snowscapes with birch trees. Some of the clear moss agates looked like dirty water, I told him. Not as pretty. I suggested that he look for asymmetry, unique shapes, and to use real sterling silver for the chains. Going downstairs to do laundry, I would see more and more trays of colorful stones. Why don’t you finish these, and I can start selling them online while you’re gone? I would say. But he said he needed more time, that it’s really hard to drill the holes. He would bring me a tray of striking new stones, his face lit up with their beauty and the possibility of creating something. He shared, in excited whisper to not wake the girls, his dreams of a jewelry business and a gallery and a café, after we move to Texas, after his paperwork was all taken care of in Guatemala. Now that this was happening, he was ready to imagine what he wanted to do, instead of just living like there wasn’t much choice. I told him that I would name each stone for him, give it a poetic name, just a word or a phrase, like forest edge, plains wind, or submerge. It could be written on an earthy slip of paper and given away with each necklace he sold. But after a while, he had too many. I wouldn’t be able to come up with that many names. Seems like my inclination is to name things, and his is to observe them, appreciate them. He didn’t quite want to let me in on his endeavor, but I thought I could help. He showed me a photo taken by the man who was getting some of the stones directly from the mine. Holding a rough chunk of pre-polished rock, I could see his brown hand and forearm, and I thought about him taking the stones from the earth, polishing them. I wondered if the earth itself would slowly crumble if we extracted too many beautiful picture stones. And how these small, rough canvasses were filed away in the earth, the lines and images formed by mineral pigments, in streaks and deposits, and how perhaps they were trying to speak, trying to form illustrations that could be named, that could resemble something. Or maybe it’s not the stones themselves trying to talk, but the earth as a whole articulating something, like even just the irony of a picture of nature from the surface of earth on a rock inside the earth. The discovery of these tiny portraits stones that are harvested, cracked, freed, the way I search for my words and wonder if they are better off inside, undiscovered, taking my strength, or outside, spoken and read, giving me strength. These picture stones are revealed, and the earth falls apart. If we stop and ask: What is left behind? He was excited about his connection to the jade mine in Guatemala and planned to visit it on his trip. This is just the first trip of many. I’m going to be going all the time now, he said. I want to be a part of his vision to sell handmade jewelry and Guatemalan coffee. All these trays sit in my basement. I told him I would make display boards while he was gone. I told him I would go to Goodwill and get some cool frames and some pretty fabric. But now I find that I have my own things to do while he’s gone, like trying to write my words, and there’s so much to think about with the move. It’s his dream. Maybe we will do it together when he comes back. He stacked all those trays to one side before he left so they wouldn’t cover the whole floor. He revisits a childhood in the mountains, and for this time he is gone, the stones sit in the basement, underground again for a time. Susan Niz's chapbook is "Beyond this Amniotic Dream," Beard Poetry, Minneapolis. Her short work has appeared in Ponder Review, Typishly, Tipton Poetry Journal, Carnival Literary Magazine, Crack the Spine, Blue Bonnet Review, Two Words For, Belleville Park Pages, Ginosko, Cezanne's Carrot, Flashquake, Opium Magazine, and Summerset Review. She has been featured in live poetry shows in Minneapolis. Susan's novel Kara, Lost (North Star Press, 2011) was a finalist for a Midwest Book Award (MIPA) for Literary Fiction. She teaches, raises kids, has been a grassroots community organizer, and conserves Monarchs. Read more articles by Susan Niz. All original work attributed to Susan Niz © 2019 Susan Niz.